During the late 1990’s we became interested in the problems associated with bone drills, especially in terms of their sharpness and its’ effect upon surgical outcomes. Studies concerning drill design showed certain design advantages but the practice of re-use continued to ensure that blunt drills were being presented to the surgical team. At the same time, growing concern over the risks of infection transmission, particularly in view of HIV and Variant CJD infections prompted a review of normal practice and, in 2002 we formed a company to produce and deliver good quality sharp products, sterile packed for single use, seeing this as a practical solution to both problems. Since that date, the company has concentrated upon a relatively small range of high quality products which, as a result of our complete focus, we are able to produce at very competitive prices and hold in stock for rapid delivery. We are also able to produce small quantities of specialised products to meet individual specific needs. 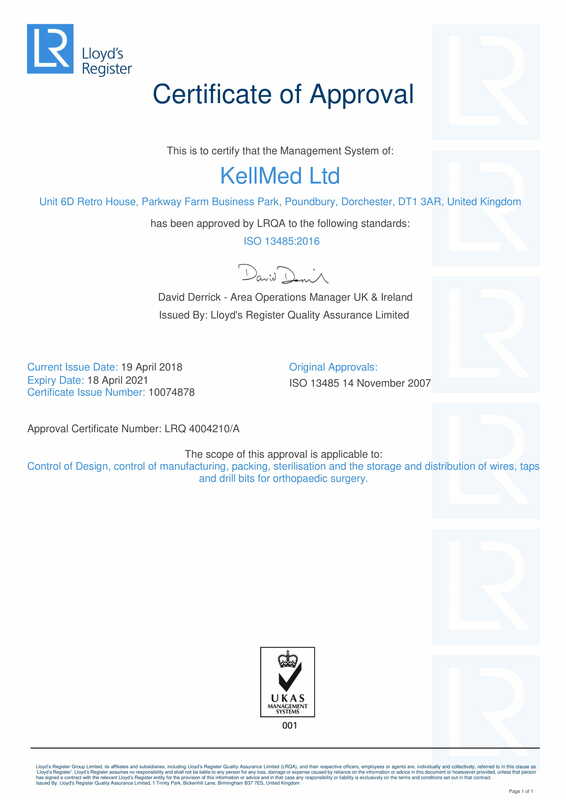 KellMed Sales Ltd. is a family firm and our ethos is to provide our customers with excellent quality, reliable and friendly customer service and highly competitive prices. By ensuring our overheads remain minimal we are able to pass on cost savings to you, the customer.